Many coastal communities would love to face the gradual accretion of more oceanfront property. But, in this case, the additional property became a maritime forest that, according to the adjacent homeowners, breeds snakes, rats, raccoons, bugs, spiders and other unwanted varmints and dangerous animals and also poses danger from fires and criminal activity. The case cites University of South Carolina Law School Professor Josh Eagle’s explanation of accretion and erosion: “Sand grains do not magically vanish from or appear on a beach; rather they are going to or coming from somewhere else along the coast.”** The Court stated that while most land use cases along our coast involve erosion, or loss of beachfront sediment, this case involves accretion, or the addition of sediment to the beach front. These litigants have been involved in more than a six-year battle over what they call a “maritime jungle”. A major component of the landowner’s objection is that their properties are taxed as if they are ocean-front properties, but the value of their properties have plummeted more than a million dollars because of lack of ocean views and breezes and lack of access to the beach. The property that separates these landowners from the ocean was conveyed by the Town to the Lowcountry Open Land Trust in 1991. Simultaneous, the Trust conveyed the land back to the town, subject to restrictions intended to preserve and conserve the natural area. The restrictions require that the property be maintained in its natural state but give the Town the authority to trim and control the growth of vegetation for the purposes of mosquito control and scenic enhancement. The Town also passed ordinances restricting the use of the property against the destruction of vegetation (except trimming, cutting and pruning). When the 1991 deeds were executed, the ocean adjacent land was covered in sea oats and wildflowers, and the litigants’ homes had unobstructed ocean views and access to ocean breezes. The Town’s brief argued that the problem dates back to Hurricane Hugo, in 1989, which destroyed all the trees on the land. Over time, natural shrubs and trees replaced the bare, hurricane-ravaged land. At the same time, sand built up, making the houses farther from the ocean. In the summer of 2010, the landowners applied to the Town for a permit to trim and prune the ocean adjacent property, but the Town denied the permit. This litigation followed. On appeal, the landowners argued that the deed restrictions require the Town to preserve the ocean adjacent property exactly as it existed in 1991. The Court of Appeals disagreed, finding that the deed was unambiguous and evidenced the intent that the Town would maintain the land’s natural character. The landowners’ interpretation would require the Town to continuously remove all vegetation from the beach that was not present in 1991, but the Court refused to read the deed to require such drastic management of the property. Elizabeth Hagood, the Executive Director of the Lowcountry Open Land Trust stated in an affidavit that the Trust periodically and regularly visited the ocean adjacent land, reviewing the existing field conditions, comparing the field conditions to the deed restrictions, and finding nothing violated the deed restrictions. As to the nuisance arguments, the Court held that those arguments sound in contract rather than tort, and nothing in the contract (the deed or the ordinances) requires the Town to clear the land. Can an alley be the basis of an appurtenant easement in SC? Two valuable downtown Charleston residential lots were the subject of an easement case decided by the South Carolina Court of Appeals on September 19. * Much to the dismay of the owners of 45 Lagare Street, the Court held that an appurtenant easement exists in the form of an alley that runs along a boundary of 45 Lagare Street for the benefit of 47 Lagare Street. Master-in-Equity Mikell Scarborough had granted summary judgment in favor of the owner of 47 Lagare Street, finding an easement appurtenant burdened 45 Lagare Street, and the Court of Appeals affirmed. Also, the full and free use and enjoyment as an easement to run with the land of the right of ingress, egress, and regress, in, over, through, and upon the alley-way eight (8) feet wide as a drive way or carriage way, situation, lying, and being immediately to the south of (47 Lagare), and being the southern boundary of said (47 Legare). Title to both lots passed to third parties, and in 1971, a new survey was drawn,** and the owners of both properties provided verbatim descriptions of the original easement and covenanted that the no buildings or obstructions would be erected on the easement area. The documents stated that the covenants would run with the land. The most recent deed of the benefited property recited the existence of the easement, but the most recent deed of the burdened property did not. In 2004, the owner of the benefited property added a chain-link fence and masonry wall along the border with the burdened property. During the trial, the Appellants argued that the easement had been abandoned and stated that the only time it was used was to allow for the Respondent’s landscapers to walk down the driveway to use the gate. Respondent testified that the easement area is also used by her family members, guests, tradesmen and other permittees to access the rear of 47 Legare for large-scale appliances, equipment, and machinery and to provide access to the only suitable area for off-street parking. She also claimed that she uses the easement to access the back of her property in a golf cart. The first issue on appeal became whether a terminus existed on 47 Legare, a requirement for an appurtenant easement. Two Supreme Court cases were discussed, Whaley v. Stevens, 21 S.C.221 (1884), which held that the terminus requirement in South Carolina only requires the dominant estate to be contiguous or adjacent to the easement. A later case, Steele v. Williams, 204 S.C. 124 (1944) held that an alleyway was an easement in gross rather than an appurtenant easement because it lacked a terminus. The Court of Appeals found Whaley controls although no South Carolina case has explicitly defined the terminus requirement. The Court held that the terminus issue is a fact-specific inquiry and that, intuitively, the dominant estate must have access to the purported easement. In addition, the Court stated, an appurtenant easement might be found if the purported easement (1) at least touches the dominant estate and (2) in cases where the easement is an adjacent boundary between—or runs parallel—to the dominant and servient estates, such as the case at hand, the easement does not extend beyond the dominant estate’s boundary. (At most, the easement ends at the lot line of the dominant estate.) In Steele, the alley extended beyond the appellant’s property. The intent of the parties was held to be determinative, and the Court held that the 1911 common owner, Hinson, clearly intended that the driveway would be an easement appurtenant. The Court next discussed the appurtenant easement requirement of necessity. 47 Legare Street obviously has direct public access on Lagare Street, but the Court held that the easement was necessary to reach the rear of the property by large-scale equipment and tools and to provide for off-street parking. We will wait to see whether our Supreme Court has the opportunity to weigh in on this issue. 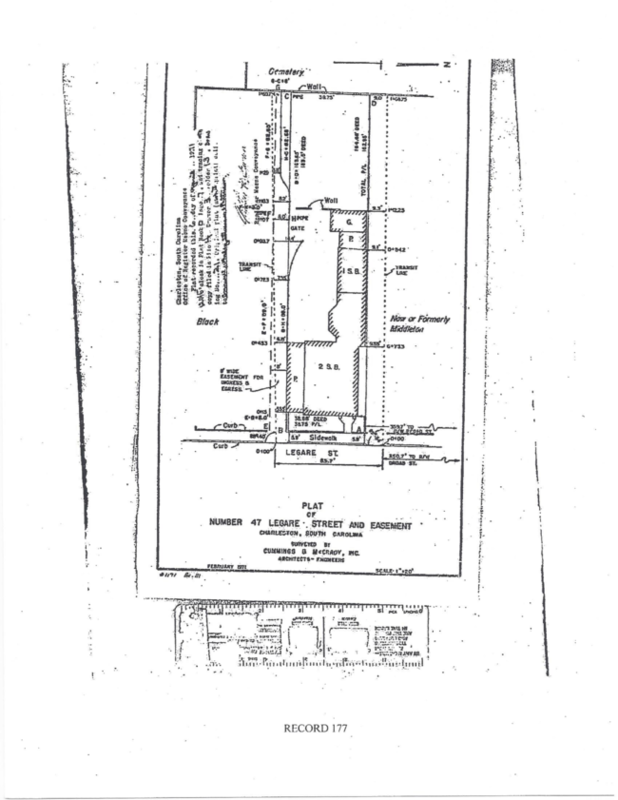 ** Plat of Number 47 Legare Street and Easement surveyed by Cummings & McCrady, Inc., dated February 1971, is attached. Although an unpublished opinion has no precedential value, an easement case* decided by the Court of Appeals on May 16 takes an interesting, common sense approach that may be useful for our analysis of future easement issues. 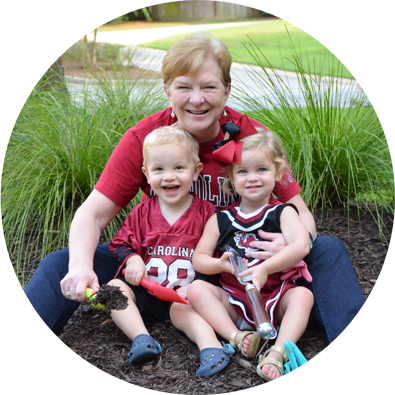 Hamilton Duncan and Ray and Elizabeth Drasites are owners of two adjacent properties located on an inland cove of Lake Murray. Mr. and Mrs. Drasites’ property abuts the water and is situated between the lake and Mr. Duncan’s one acre parcel. Both parties acquired their respective properties with reference to an easement granting Duncan a right of access over the Drasites’ property to a terminus at the 360 foot contour of Lake Murray. Testimony before the Master-in-Equity established that the 360 foot contour is Lake Murray’s high water mark and represents the boundary between the lake, managed by South Carolina Electric and Gas Company (SCE&G), and privately-owned property. Master-in-Equity Strickland ordered that Duncan has an easement for the purpose of accessing Lake Murray, that Duncan can use the easement to launch small watercraft, and that the Drasites are enjoined from interfering with the easement. The Drasites acknowledged the existence of an easement for a road running generally along the southeastern boundary of their property, but they argued that the length of the easement did not extend to the lake. The Court of Appeals indicated that common sense and good faith are the leading touchstones in determining the extent of an easement and that consideration must be given to what is essentially necessary to the enjoyment of the dominant property. The Court stated it did not believe it was the grantor’s intent to give the dominant estate a right of access just shy of the lake depending on whether the water level is high or low or for a dirt road traversing the southern boundary of the Drasites’ property but just short of the lake. The Court held that Duncan is responsible for bearing the cost of maintaining the easement, and any improvements must be subject to the approval of SCE&G. And the Court reminded Duncan that an easement is limited to a use that is reasonably necessary and convenient and as little burdensome to the servient estate as possible. Stated another way, the Court held that the owner of an easement has all the rights incident or necessary to its property enjoyment, but nothing more. I always prefer a common sense approach. There was apparently little evidence of the extent of the easement since no survey was prepared contemporaneously with it. With the exception of the plats prepared for litigation, all plats in the parties’ chains of title show the easement terminating at the waters of Lake Murray. The Drasites based their argument on a plat outside the chains of title which depicted the road short of the lake. The Court was not impressed with that evidence. In January, I blogged about a Federal class action lawsuit filed in Charleston seeking to invalidate non-condo foreclosures by owners’ associations. You can read that blog here but the short version is that the suit challenges foreclosures on the grounds that these non-profit corporations don’t have the power to create liens for unpaid assessments prior to obtaining judicial judgments. Condominium associations established through the Horizontal Property Regime Act have statutory authority to create liens, but the power of non-condo projects is created by restrictive covenants. We’ll have to wait and see how that suit turns out, but if the plaintiffs there are successful, foreclosure practice will change drastically in South Carolina. This appeal was handled by the law office of my friend, Brian Boger, a Columbia lawyer and well-known champion of consumers’ rights. The appeal argued that the $3,036 successful bid “shocked the conscience” and violated equitable principles. The parties agreed that the home was valued at $128,000. There was a mortgage balance of $66,004, leaving equity of $61,996. The Hales did not argue that there were irregularities in foreclosure process, but instead argued that the low bid should have encouraged the Master to use his gavel to “do equity”. Comparing the successful bid to their equity using the “Equity Method”, the Hales argued that the bid amounted to 4.8% of the fair market value of the property. The HOA argued, using the “Debt Method”, that the bid must be added to the senior mortgage balance to judge its sufficiency because the successful bidder would have to pay the senior mortgage to have good title. In this case, using the Debt Method, the bid amounted to 54.94% of the fair market value. The Court of Appeals agreed that the Debt Method was the proper method for considering a senior encumbrance in a foreclosure. The Court found no South Carolina cases that expressly weighed the two methods of judging a bid, but pointed to prior cases that considered the amount of a senior mortgage in the determination and found a 3.15% bid sufficient. One reason the Court of Appeals prefers the Debt Method is that it will result in “fewer set asides”. In other words, the Court of Appeals is not interested in upsetting the foreclosure practice applecart at this point. Justice Lockemy dissented, stating that he thought it improper to give a judicial sale buyer credit for assuming a debt it is not legally required to pay. He said the Court’s decision could create a perverse circumstance where a judicial sale bidder purchases property for a de minimis amount simply to capitalize on rental revenue until the senior lienholder forecloses. The majority called this argument a solution in search of a problem because there was no evidence that the successful bidder in this case was engaged in such a scheme and because the successful bidder must satisfy the mortgage to obtain clear title. Foreclosure practice in South Carolina remains the same…for now. A quick search the Internet for stories on “Captain Sam’s Spit” in Kiawah Island will reveal a treasure trove of news, opinion and case law involving the proposed development of a gorgeous but extremely precarious tract of pristine beach property on South Carolina’s coast. This link contains a picture. Real estate development is my bread and butter, but one quick look told me that property should not be developed. A fellow field tripper, however, pointed out that the south end of Pawleys Island, which has been developed for many years, is just as precarious. An entity that fights these cases in our state is the South Carolina Environmental Law Project located in Pawleys Island. A recent case* fought by this entity was decided by the South Carolina Court of Appeals on September 27. This case involves a 4.62 acre tract of beachfront property on Kiawah Island, not far from Captain Sam’s Spit. Here are greatly simplified facts in a very complicated case: the developer and the community association entered into a development agreement in 1994. That agreement covered many issues, one of which was the proposed conveyance from the developer to the community association of a ten-mile strip of beachfront property, basically, the entire length of the island. A deed consummated that conveyance in 1995. All of the property conveyed was undevelopable because of the State’s jurisdictional lines. I didn’t learn the following fact from the case, but I learned it from one of the lawyers who was kind enough to speak with me. When the jurisdictional lines were redrawn by the State, the 4.62 acre tract became developable. The developer then took the position that the 1994 development agreement and the 1995 deed resulted from a mutual mistake, and that the parties never intended to include that tract. The Master-in-Equity and Court of Appeals did not see it that way. Both found that the agreement and deed were unambiguous and that parole evidence of the intent of the parties was not allowable. Simple enough, right? As the football prognosticator, Lee Corso would say, “not so fast, my friends.” If the litigation history of Captain Sam’s Spit is a barometer, litigation may continue for years over the 4.62 acre tract. Captain Sam’s Spit has been argued in the South Carolina Supreme Court four times. I understand one of the justices used the term “weary” to describe the reaction of the court to the most recent round in the battle. Count on a petition for rehearing and an appeal in this case, at least. I’ll keep you posted!